In this project we will be teaching a neural network to translate from French to English. > il est en train de peindre un tableau . = he is painting a picture . < he is painting a picture . > pourquoi ne pas essayer ce vin delicieux ? = why not try that delicious wine ? < why not try that delicious wine ? > elle n est pas poete mais romanciere . = she is not a poet but a novelist . < she not not a poet but a novelist . > vous etes trop maigre . = you re too skinny . < you re all alone . … to varying degrees of success. 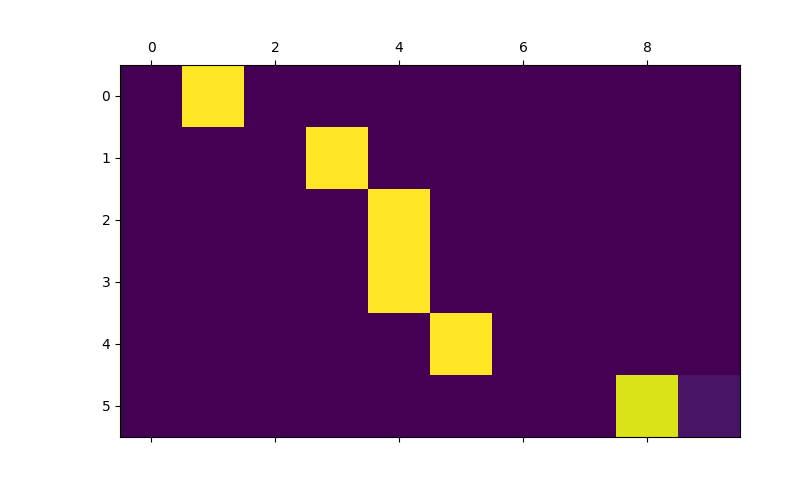 This is made possible by the simple but powerful idea of the sequence to sequence network, in which two recurrent neural networks work together to transform one sequence to another. An encoder network condenses an input sequence into a vector, and a decoder network unfolds that vector into a new sequence. 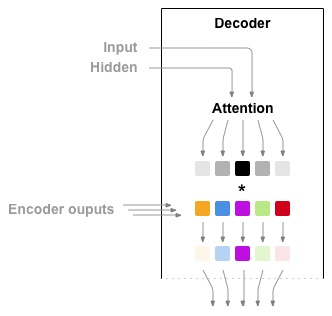 To improve upon this model we’ll use an attention mechanism, which lets the decoder learn to focus over a specific range of the input sequence. You will also find the previous tutorials on Classifying Names with a Character-Level RNN and Generating Names with a Character-Level RNN helpful as those concepts are very similar to the Encoder and Decoder models, respectively. The data for this project is a set of many thousands of English to French translation pairs. I am cold. J'ai froid. 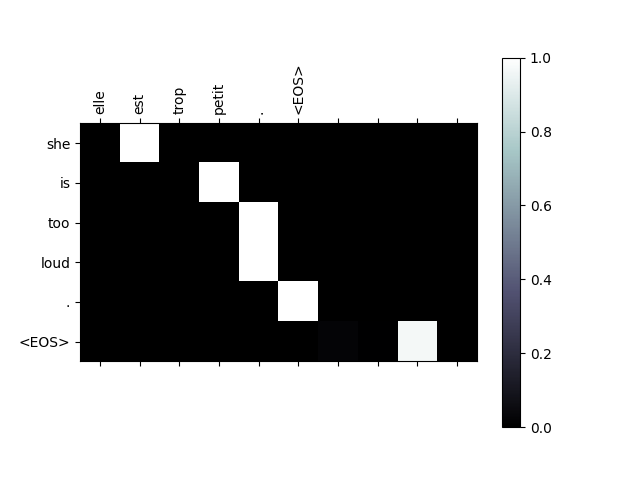 Similar to the character encoding used in the character-level RNN tutorials, we will be representing each word in a language as a one-hot vector, or giant vector of zeros except for a single one (at the index of the word). Compared to the dozens of characters that might exist in a language, there are many many more words, so the encoding vector is much larger. We will however cheat a bit and trim the data to only use a few thousand words per language. We’ll need a unique index per word to use as the inputs and targets of the networks later. To keep track of all this we will use a helper class called Lang which has word → index (word2index) and index → word (index2word) dictionaries, as well as a count of each word word2count to use to later replace rare words. The files are all in Unicode, to simplify we will turn Unicode characters to ASCII, make everything lowercase, and trim most punctuation. To read the data file we will split the file into lines, and then split lines into pairs. The files are all English → Other Language, so if we want to translate from Other Language → English I added the reverse flag to reverse the pairs. Since there are a lot of example sentences and we want to train something quickly, we’ll trim the data set to only relatively short and simple sentences. Here the maximum length is 10 words (that includes ending punctuation) and we’re filtering to sentences that translate to the form “I am” or “He is” etc. (accounting for apostrophes replaced earlier). 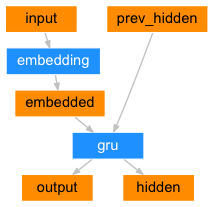 "they are", "they re "
A Recurrent Neural Network, or RNN, is a network that operates on a sequence and uses its own output as input for subsequent steps. A Sequence to Sequence network, or seq2seq network, or Encoder Decoder network, is a model consisting of two RNNs called the encoder and decoder. The encoder reads an input sequence and outputs a single vector, and the decoder reads that vector to produce an output sequence. 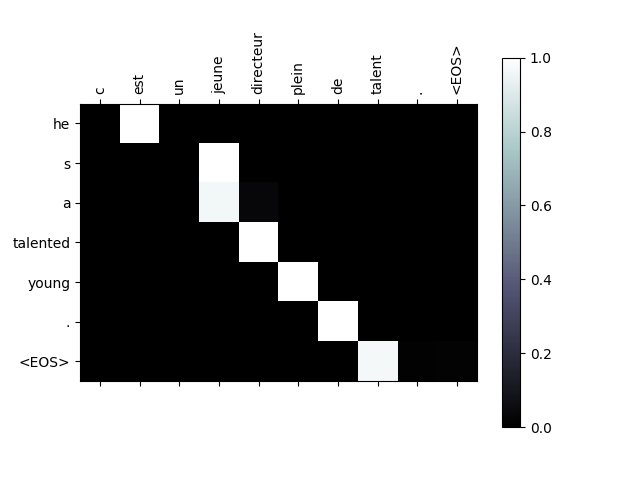 Unlike sequence prediction with a single RNN, where every input corresponds to an output, the seq2seq model frees us from sequence length and order, which makes it ideal for translation between two languages. Consider the sentence “Je ne suis pas le chat noir” → “I am not the black cat”. Most of the words in the input sentence have a direct translation in the output sentence, but are in slightly different orders, e.g. “chat noir” and “black cat”. Because of the “ne/pas” construction there is also one more word in the input sentence. It would be difficult to produce a correct translation directly from the sequence of input words. 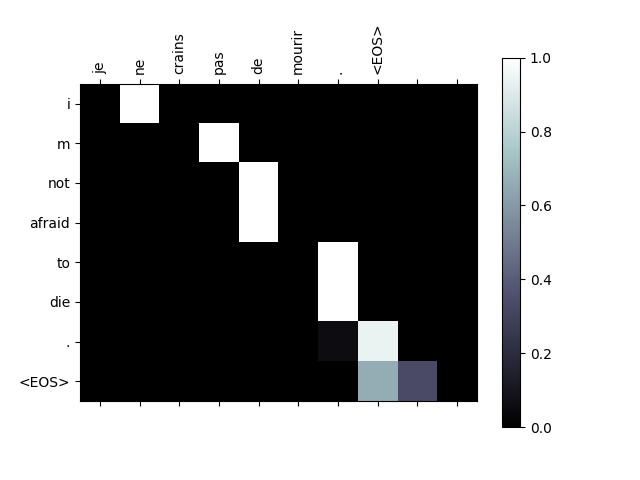 With a seq2seq model the encoder creates a single vector which, in the ideal case, encodes the “meaning” of the input sequence into a single vector — a single point in some N dimensional space of sentences. 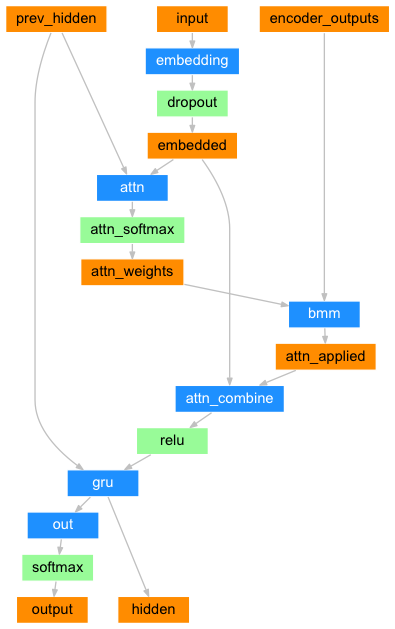 The encoder of a seq2seq network is a RNN that outputs some value for every word from the input sentence. For every input word the encoder outputs a vector and a hidden state, and uses the hidden state for the next input word. 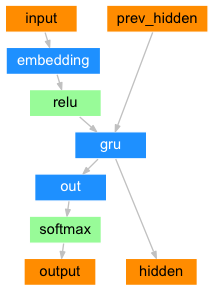 The decoder is another RNN that takes the encoder output vector(s) and outputs a sequence of words to create the translation. In the simplest seq2seq decoder we use only last output of the encoder. This last output is sometimes called the context vector as it encodes context from the entire sequence. This context vector is used as the initial hidden state of the decoder. At every step of decoding, the decoder is given an input token and hidden state. The initial input token is the start-of-string <SOS> token, and the first hidden state is the context vector (the encoder’s last hidden state). I encourage you to train and observe the results of this model, but to save space we’ll be going straight for the gold and introducing the Attention Mechanism. If only the context vector is passed betweeen the encoder and decoder, that single vector carries the burden of encoding the entire sentence. Attention allows the decoder network to “focus” on a different part of the encoder’s outputs for every step of the decoder’s own outputs. First we calculate a set of attention weights. These will be multiplied by the encoder output vectors to create a weighted combination. The result (called attn_applied in the code) should contain information about that specific part of the input sequence, and thus help the decoder choose the right output words. Calculating the attention weights is done with another feed-forward layer attn, using the decoder’s input and hidden state as inputs. Because there are sentences of all sizes in the training data, to actually create and train this layer we have to choose a maximum sentence length (input length, for encoder outputs) that it can apply to. Sentences of the maximum length will use all the attention weights, while shorter sentences will only use the first few. There are other forms of attention that work around the length limitation by using a relative position approach. Read about “local attention” in Effective Approaches to Attention-based Neural Machine Translation. To train, for each pair we will need an input tensor (indexes of the words in the input sentence) and target tensor (indexes of the words in the target sentence). While creating these vectors we will append the EOS token to both sequences. To train we run the input sentence through the encoder, and keep track of every output and the latest hidden state. Then the decoder is given the <SOS> token as its first input, and the last hidden state of the encoder as its first hidden state. “Teacher forcing” is the concept of using the real target outputs as each next input, instead of using the decoder’s guess as the next input. Using teacher forcing causes it to converge faster but when the trained network is exploited, it may exhibit instability. 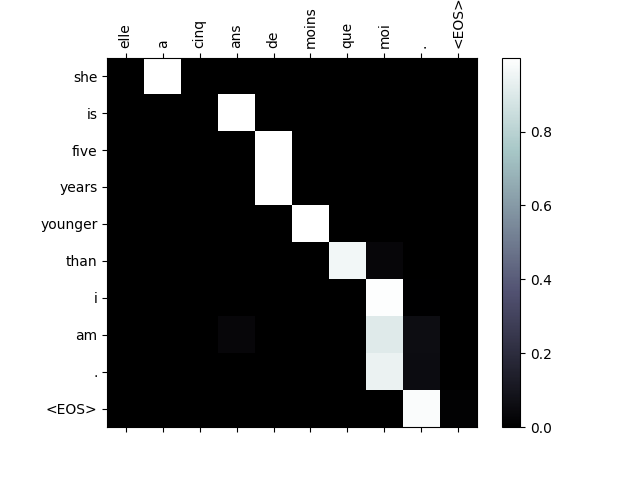 You can observe outputs of teacher-forced networks that read with coherent grammar but wander far from the correct translation - intuitively it has learned to represent the output grammar and can “pick up” the meaning once the teacher tells it the first few words, but it has not properly learned how to create the sentence from the translation in the first place. Because of the freedom PyTorch’s autograd gives us, we can randomly choose to use teacher forcing or not with a simple if statement. Turn teacher_forcing_ratio up to use more of it. This is a helper function to print time elapsed and estimated time remaining given the current time and progress %. Then we call train many times and occasionally print the progress (% of examples, time so far, estimated time) and average loss. 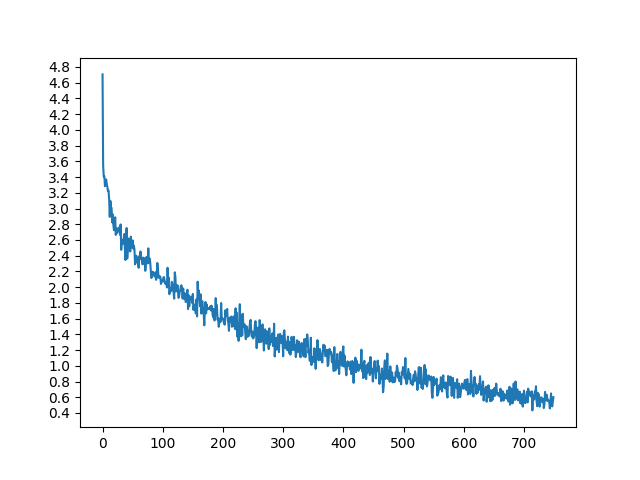 Plotting is done with matplotlib, using the array of loss values plot_losses saved while training. Evaluation is mostly the same as training, but there are no targets so we simply feed the decoder’s predictions back to itself for each step. Every time it predicts a word we add it to the output string, and if it predicts the EOS token we stop there. We also store the decoder’s attention outputs for display later. With all these helper functions in place (it looks like extra work, but it makes it easier to run multiple experiments) we can actually initialize a network and start training. Remember that the input sentences were heavily filtered. For this small dataset we can use relatively small networks of 256 hidden nodes and a single GRU layer. After about 40 minutes on a MacBook CPU we’ll get some reasonable results. If you run this notebook you can train, interrupt the kernel, evaluate, and continue training later. Comment out the lines where the encoder and decoder are initialized and run trainIters again. > je suis enchante de te rencontrer . = i m delighted to meet you . > elles sont miennes . = they re mine . > c est un voyant . = he is a psychic . > nous sommes sous son commandement . = we are under his command . > je suis impressionnee par votre francais . = i m impressed with your french . > elle ressemble beaucoup a sa mere . = she is very much like her mother . > il est peu sur de lui . = he s insecure . > ta chance est epuisee . = you re out of luck . > je demenage le mois prochain . = i am moving next month . > il est photogenique . = he s photogenic . A useful property of the attention mechanism is its highly interpretable outputs. Because it is used to weight specific encoder outputs of the input sequence, we can imagine looking where the network is focused most at each time step. input = elle a cinq ans de moins que moi . input = elle est trop petit . input = je ne crains pas de mourir . input = c est un jeune directeur plein de talent . Try with more layers, more hidden units, and more sentences. Compare the training time and results.